Save the date: October 13th for LOVE IN ACTION: a day-long meditation retreat led by guest speaker and Becca’s personal teacher in the Zen Buddhist tradition, Deborah Eden Tull. Scholarships are available for those who need it. Email mettaslc@gmail.com for scholarship requests. We all struggle at times with how to bring our meditation practice into the beautiful, dynamic, and messy realm of relationship. Relational Mindfulness helps us to bring presence, compassion, investigation, and clear-seeing to how we relate — whether we are at work, with family, in conflict, on a date, or engaging with world issues. We can erase the myth of separation. And we can remember the intrinsic interconnection that is who we really are. This transformative practice is a means for remembering that the quality of every relationship we will ever have stems from the quality of our relationship with ourselves. Based on Eden’s newest book, RELATIONAL MINDFULNESS, this restorative and experiential retreat offers illuminating and heart-opening practices that can be integrated into every moment of life. It involves meditation, relational practices, writing, and facilitated group discussion. With Eden and others, return to a simple understanding — that the subtlest form of love is attention — something we can only remember when we are present. Please wear comfortable clothing for meditation and bring a journal. Please join us for this very special book signing and dharma talk with Zen teacher, Deborah Eden Tull. Bring a loved one, friend or spouse. If you haven't registered for our one day retreat LOVE IN ACTION, led by Deborah the following day, you can do so here. CLASS IS FULL: Art and Mindfulness Camp this Summer for Girls ages 9-12. Attention Parents! Stella and I will be hosting an art and mindfulness camp this summer for girls ages 9-12. Stella will be teaching art classes about fashion illustration, vision boarding, and painting, and Becca will start the day with Mindfulness + Meditation. 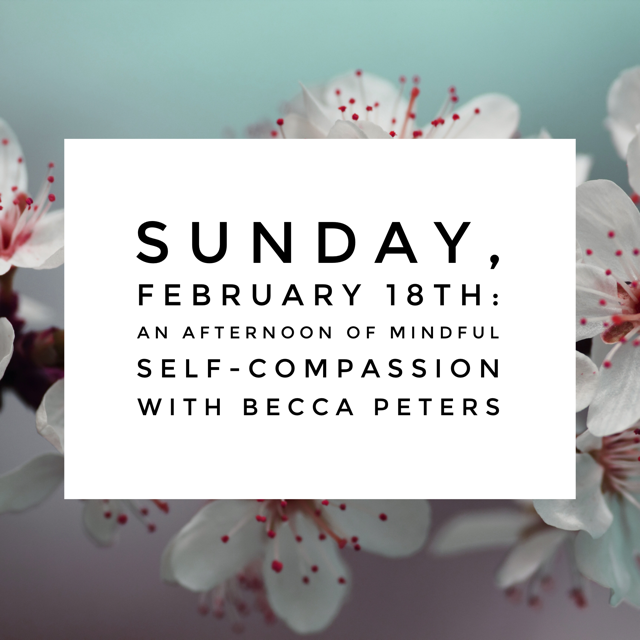 Join Becca Peters for a liberating afternoon of self-care. We will practice Mindfulness Meditation followed by simple + effective ways to bring Self-Compassion into daily life, making room for greater ease + joy. If you are a new or seasoned meditation practitioner, we welcome you! *Registration in advance is highly recommended as space is limited. Please bring a journal and writing instrument. Wear comfortable clothing and a meditation cushion if you have one.